Rehab Directors coordinate all the activities related to rehabilitation services. 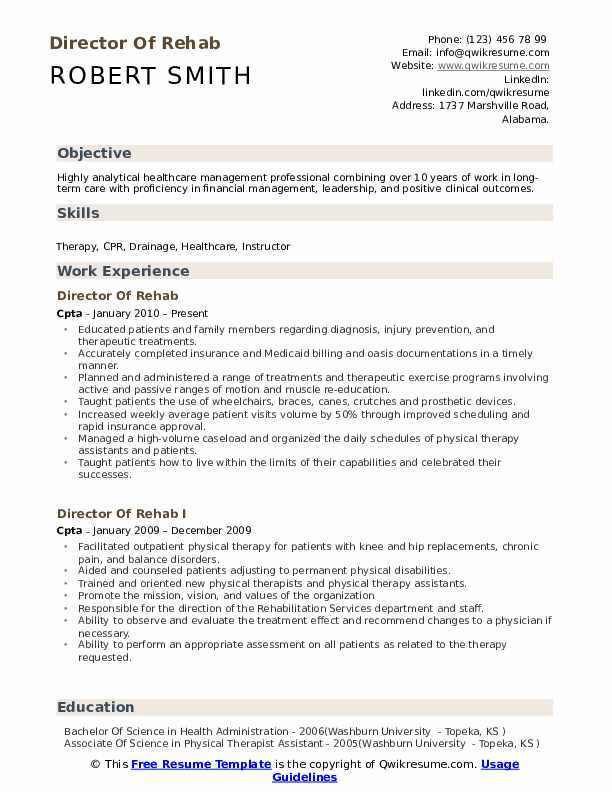 For improving the lives of people living in the rehab facilities, the Director of Rehab performs the following roles and responsibilities – developing and implementing rehabilitation programs, setting and implementing guidelines for various programs such as speech therapies or physical therapies; recruiting and training staff, evaluating patient care, allocating budget and cultivating strong relationship with health-related professionals. 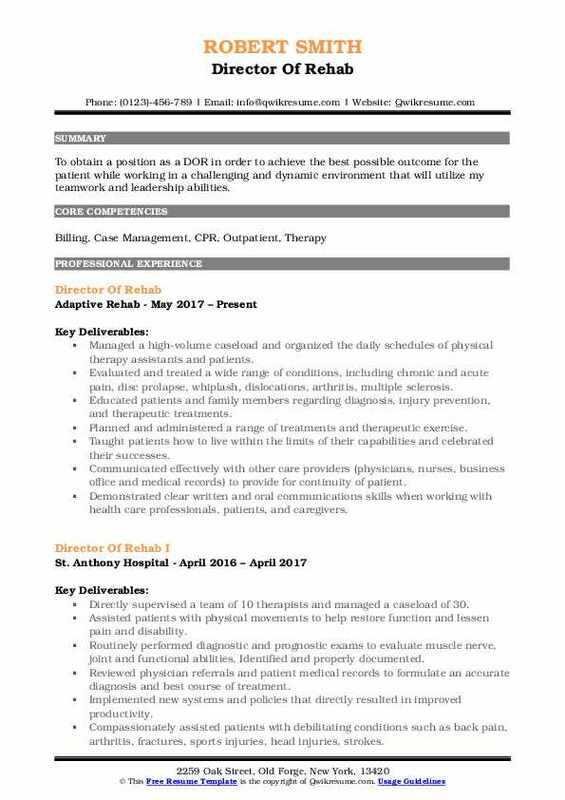 The most sought-after skills normally listed in the Director of Rehab Resume are confidentiality, patience, planning, leadership, and positive attitude. They should have sound knowledge of behavioral science, social work, counseling skills and various methods of rehabilitation therapies. These directors should have the ability to deal with difficult people and be able to work under any pressurizing conditions. 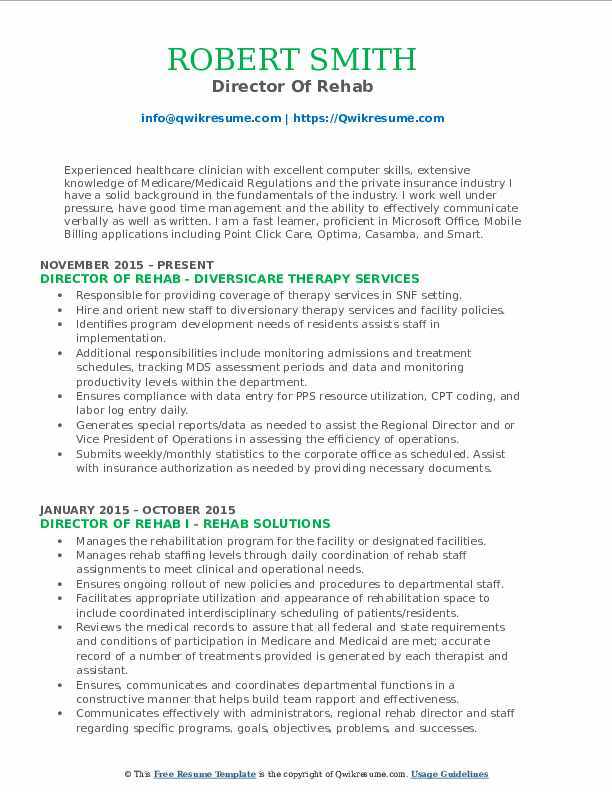 This position requires the candidate to possess a degree preferably in the field of rehabilitative services. Summary : Highly analytical healthcare management professional combining over 10 years of work in long-term care with proficiency in financial management, leadership, and positive clinical outcomes. Educated patients and family members regarding diagnosis, injury prevention, and therapeutic treatments. Accurately completed insurance and Medicaid billing and oasis documentations in a timely manner. Planned and administered a range of treatments and therapeutic exercise programs involving active and passive ranges of motion and muscle re-education. Taught patients the use of wheelchairs, braces, canes, crutches and prosthetic devices. Increased weekly average patient visits volume by 50% through improved scheduling and rapid insurance approval. Managed a high-volume caseload and organized the daily schedules of physical therapy assistants and patients. Administered massages and traction to relieve pain, improve comfort levels and decrease or prevent deformity or crippling. Summary : Quality, result-driven and successful rehabilitation leader with a strong complement of clinical and managerial skills in diverse settings. Proven track record of excellence in staff management, operational and financial initiatives required to run a streamlined rehab department. Strong leadership, problem resolution, and accomplished patient care skills across diverse cultures and locations. Direct a 188-bed rehab (ortho and neuro-based) facility with approx. 35 therapists (PT/OT/ST) providing primarily short-term care with a quick turn over back to the safest prior living environment. Enhanced the financial performance against monthly expenses revenue budget by improving the overall contribution margin by 8-10% in less than 2 months. Excel in overall customer care by working closely with physicians, nursing management, and case managers in addressing patient family needs while being considerate of the company's goals. Act as a liaison with the medical director, facility's administrator, and the corporate to effectively coordinate clinical and operational matters. Initiated currently executing community re-integration program for safe. Established a functional maintenance program in the facility to prevent a decline in patients overall functional abilities. Collaborate with staff at all professional levels to identify areas of improvement. Communicate staff scheduling with RAA and the staffing coordinator in a timely and organized manner for improved operational efficiency. Conduct several meetings for any patient and staff-related concerns including daily stand-ups, daily PPs, patient care plan, and weekly rehab meetings. Objective : A hard working and enthusiastic professional, with a Master of Science in Occupational Therapy and on-the-job experience in: Long Term Acute Care, Skilled Nursing Care, Adult In-Patient Care, Physical Medicine and Rehabilitation, and Outpatient Pediatric Care. Assumes responsibility for the efficient and profitable management of rehabilitation services in the assigned site(s) of service. Monitors the standard of clinical services being delivered and maintained on all sites and ensures an ethical and compliant product is being delivered. Operationally manages GRS personnel and consultants within facility or home care contracts. Ensures accountability for the provision of evidence based care and adherence to care delivery standards. Reviews monthly department and individual therapist outcomes and supports staff in identifying strategies to improve outcomes as needed. Assists therapy staff in identifying and removing barriers to treatment and providing clinical education to meet the needs of the patient. Takes responsibility for the development and support of all staff in their site to include rounding, coaching and mentoring. 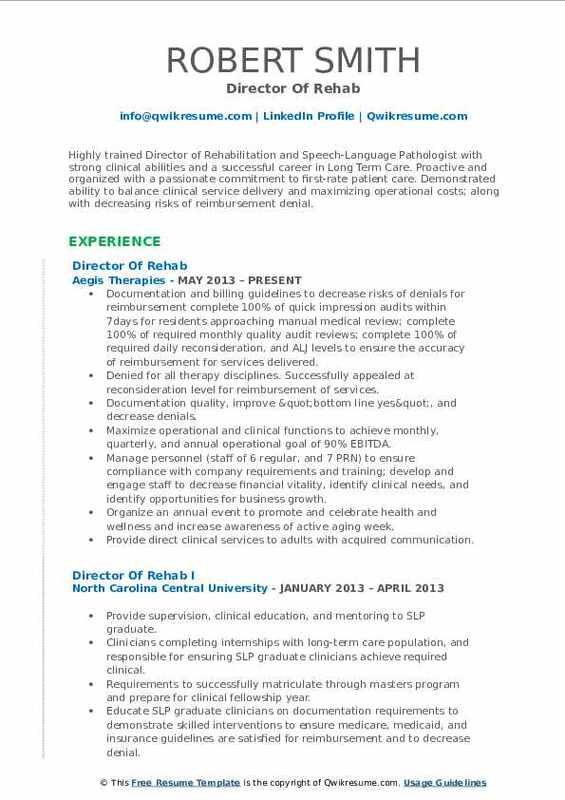 Assumes responsibility for hiring therapy staff (in conjunction with the director, area clinical operations). 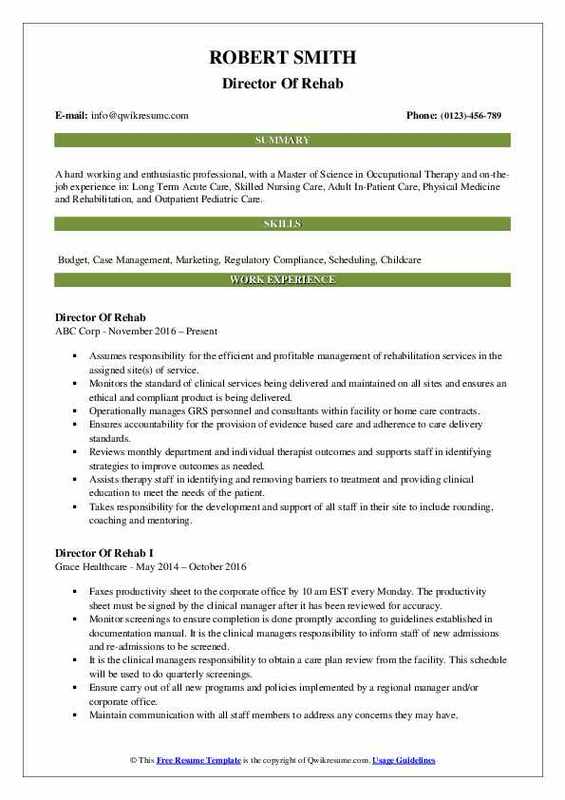 Assumes responsibility for daily staffing and utilization with input from treating therapists, consideration of clinical requirements, and recommendations from the regional clinical director. Headline : Highly trained Director of Rehabilitation and Speech-Language Pathologist with strong clinical abilities and a successful career in Long Term Care. Proactive and organized with a passionate commitment to first-rate patient care. 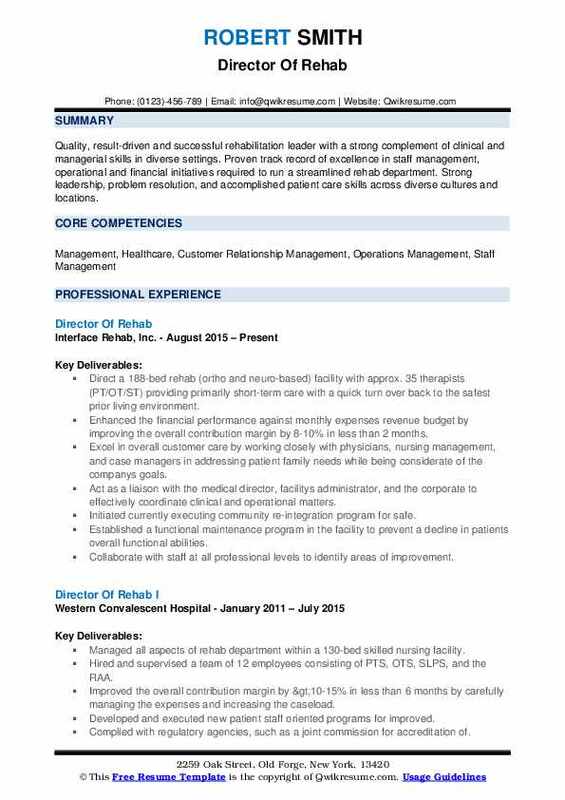 Demonstrated ability to balance clinical service delivery and maximizing operational costs; along with decreasing risks of reimbursement denial. Documentation and billing guidelines to decrease risks of denials for reimbursement: complete 100% of quick impression audits within 7days for residents approaching manual medical review; complete 100% of required monthly quality audit reviews; complete 100% of required daily reconsideration, and ALJ levels to ensure the accuracy of reimbursement for services delivered. Denied for all therapy disciplines. Successfully appealed at reconsideration level for reimbursement of services. Documentation quality, improve "bottom line yes", and decrease denials. Maximize operational and clinical functions to achieve monthly, quarterly, and annual operational goal of 90% EBITDA. Manage personnel (staff of 6 regular, and 7 PRN) to ensure compliance with company requirements and training; develop and engage staff to decrease financial vitality, identify clinical needs, and identify opportunities for business growth. Organize an annual event to promote and celebrate health and wellness and increase awareness of active aging week. Provide direct clinical services to adults with acquired communication. Swallowing, and/or cognitive disorders to restore, adapt or compensate. Underlying impairments for maximum functional outcomes in long-term and short-term care setting. Summary : A Responsible Therapist who takes pride in work. I provide quality treatments to the best of my ability. An honest, caring individual who interacts well with the public and have good communication skills. Works well with speech and physical therapy and all others involved to ensure the patients are getting the best quality treatment. Have over 17 years of experience working with geriatrics, MR/DD, pediatrics, home health, and outpatient. Responsible for managing OT, PT, speech therapy services to a sub-acute long-term population of 180+ residents. Developed and implemented integrated clinical programs across disciplines such as breakfast club, re-motivation dining room, walk to dine, and CHF program. Developed, implemented and provided training for restorative nursing program. Developed interdisciplinary care plans in collaborative engagement across rehab, nursing, social services, and activities. Integral part of falls review team, restraint reduction team, wound team, quality assurance, and quality improvement processes. As a member of the compliance committee, provided compliance know-how leadership to several other tender touch managed facilities. Responsible for hiring, training, and managing a staff of 20-25 rehab specialists comprising of full-time employees and contractors. Responsible for overseeing all aspects of clinical programs - such as staffing, patient assignment, utilization reviews. Responsible for planning ards, maximizing utilization and monthly billing reviews. 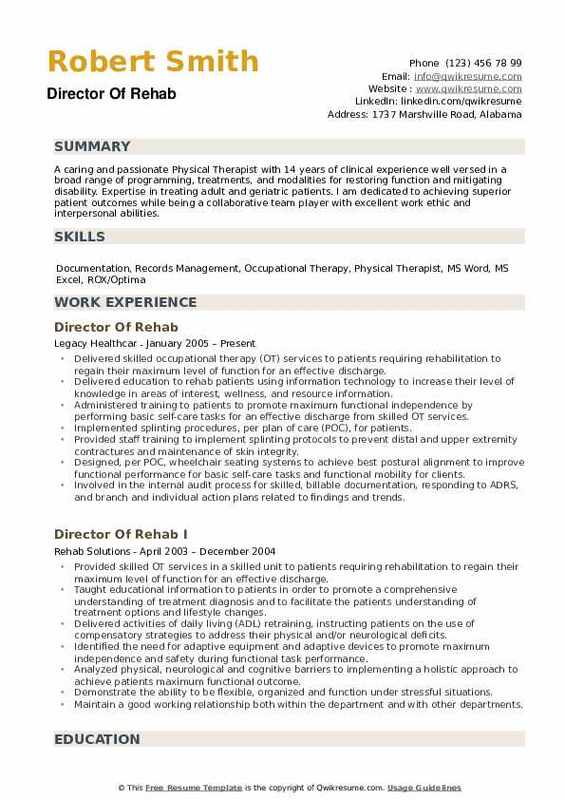 Summary : Motivated, personable business professional and a successful 10-year track record of profitable rehab department. Talent for quickly mastering technology. Diplomatic and tactful with professionals and non-professionals at all levels. Accustomed to handling sensitive, confidential records. Demonstrated history of producing accurate, timely reports meeting stringent HMO, Medicare, and insurance guidelines. Flexible and versatile. Directly supervised 20 interdisciplinary therapists with 3 physical therapy aides and managed a caseload of 30-80 patients in a 270-bed inpatient facility productivity. Recommended equipment and in-home modifications. Developed Clinical programs for LTC residents. Planned for discharges and communicated Findings and progress in detailed reports in PPS/ur meetings. Maintained organized documentation and patient files. Facilitated ADLS and assisted patients with functional mobility to increase comfort and quality of life. Instructed patients in the safe and effective use of pulleys, weights, inclined surfaces and other equipment. Very well versed in daily scheduling within the rules/regulations honoring medicare. 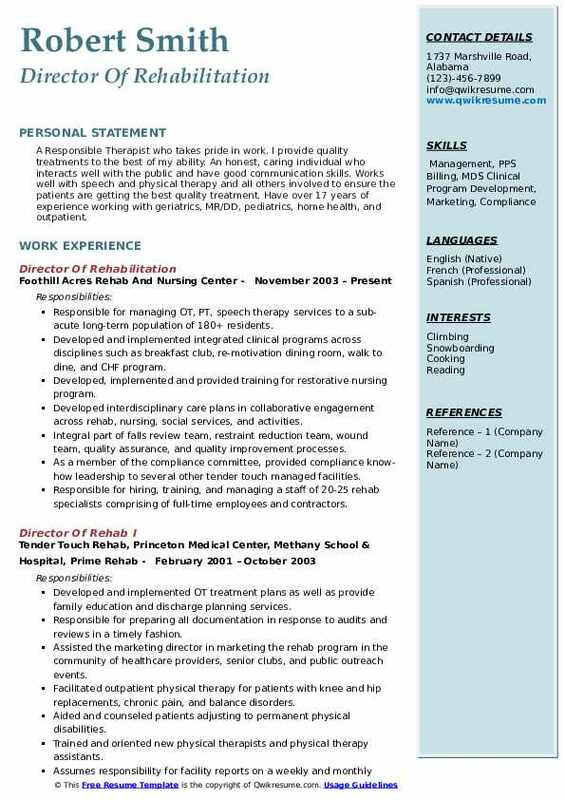 Objective : Experienced healthcare clinician with excellent computer skills, extensive knowledge of Medicare/Medicaid Regulations and the private insurance industry I have a solid background in the fundamentals of the industry. I work well under pressure, have good time management and the ability to effectively communicate verbally as well as written. I am a fast learner, proficient in Microsoft Office, Mobile Billing applications including Point Click Care, Optima, Casamba, and Smart. Responsible for providing coverage of therapy services in SNF setting. 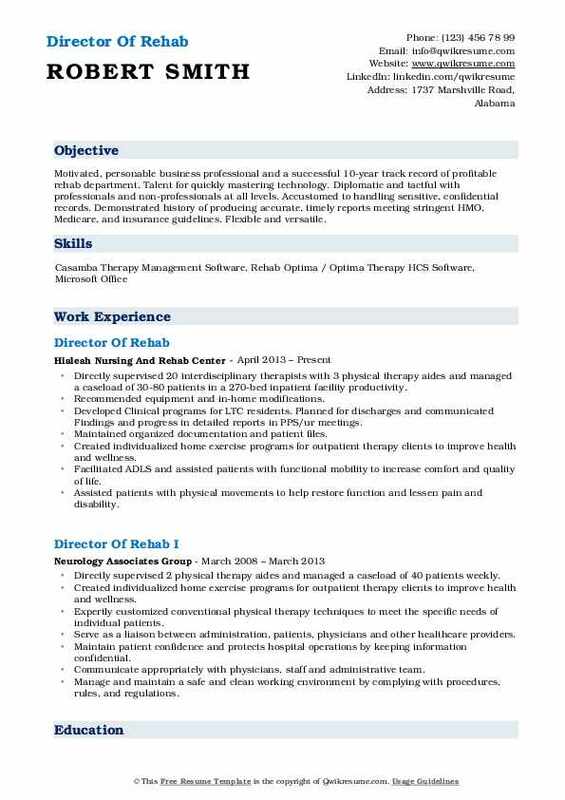 Hire and orient new staff to diversionary therapy services and facility policies. Identifies program development needs of residents assists staff in implementation. Additional responsibilities include monitoring admissions and treatment schedules, tracking MDS assessment periods and data and monitoring productivity levels within the department. Ensures compliance with data entry for PPS resource utilization, CPT coding, and labor log entry daily. Generates special reports/data as needed to assist the Regional Director and or Vice President of Operations in assessing the efficiency of operations. Submits weekly/monthly statistics to the corporate office as scheduled. Assist with insurance authorization as needed by providing necessary documents. Assist with acquisitions of new facilities as needed as part of the ambassador team. Participate in marketing calls to recruit physicians and identify new referral sources. Objective : To obtain a position as a DOR in order to achieve the best possible outcome for the patient while working in a challenging and dynamic environment that will utilize my teamwork and leadership abilities. Evaluated and treated a wide range of conditions, including chronic and acute pain, disc prolapse, whiplash, dislocations, arthritis, multiple sclerosis. Planned and administered a range of treatments and therapeutic exercise. Communicated effectively with other care providers (physicians, nurses, business office and medical records) to provide for continuity of patient. Demonstrated clear written and oral communications skills when working with health care professionals, patients, and caregivers. Working alongside facility building office manager to ensure accurate Medicare and insurance billing. 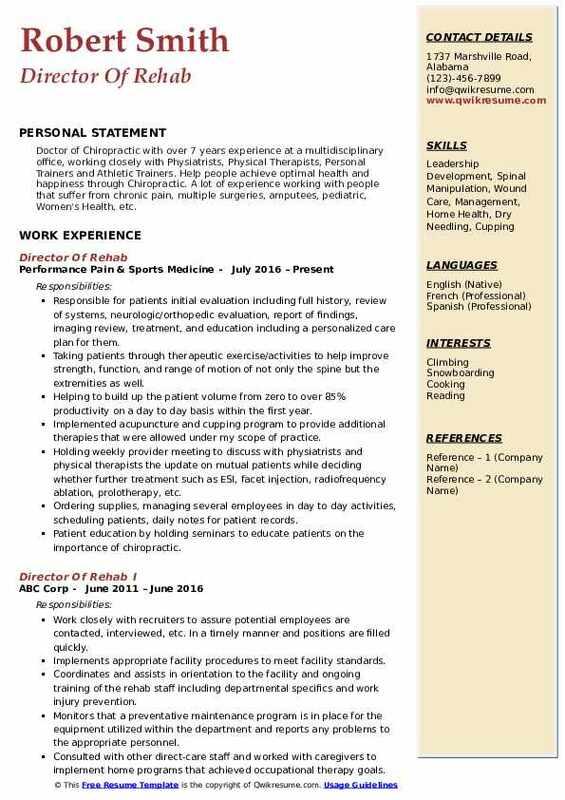 Summary : Doctor of Chiropractic with over 7 years experience at a multidisciplinary office, working closely with Physiatrists, Physical Therapists, Personal Trainers and Athletic Trainers. Help people achieve optimal health and happiness through Chiropractic. A lot of experience working with people that suffer from chronic pain, multiple surgeries, amputees, pediatric, Women's Health, etc. Responsible for patients initial evaluation including full history, review of systems, neurologic/orthopedic evaluation, report of findings, imaging review, treatment, and education including a personalized care plan for them. Taking patients through therapeutic exercise/activities to help improve strength, function, and range of motion of not only the spine but the extremities as well. Helping to build up the patient volume from zero to over 85% productivity on a day to day basis within the first year. Implemented acupuncture and cupping program to provide additional therapies that were allowed under my scope of practice. Holding weekly provider meeting to discuss with physiatrists and physical therapists the update on mutual patients while deciding whether further treatment such as ESI, facet injection, radiofrequency ablation, prolotherapy, etc. Ordering supplies, managing several employees in day to day activities, scheduling patients, daily notes for patient records. Patient education by holding seminars to educate patients on the importance of chiropractic. Provide prior authorizations to insurance companies on behalf of patients. Summary : A caring and passionate Physical Therapist with 14 years of clinical experience well versed in a broad range of programming, treatments, and modalities for restoring function and mitigating disability. Expertise in treating adult and geriatric patients. I am dedicated to achieving superior patient outcomes while being a collaborative team player with excellent work ethic and interpersonal abilities. Delivered skilled occupational therapy (OT) services to patients requiring rehabilitation to regain their maximum level of function for an effective discharge. Delivered education to rehab patients using information technology to increase their level of knowledge in areas of interest, wellness, and resource information. Administered training to patients to promote maximum functional independence by performing basic self-care tasks for an effective discharge from skilled OT services. Implemented splinting procedures, per plan of care (POC), for patients. Provided staff training to implement splinting protocols to prevent distal and upper extremity contractures and maintenance of skin integrity. Designed, per POC, wheelchair seating systems to achieve best postural alignment to improve functional performance for basic self-care tasks and functional mobility for clients. Involved in the internal audit process for skilled, billable documentation, responding to ADRS, and branch and individual action plans related to findings and trends. Oversee the rehab staff and day to day interactions with the rehab leadership team. Responsible for maintaining performance improvement activities within the department as well as maintaining efficient and effective operations. Promoting the mission, vision, and values of the organization is the top priority.